A book that presents the fifty prominent characters in the Bible and one significant fact about each of them. Along with the simple, easy to understand presentation, each page of the book contains logic games, colouring sheets, games and crossword puzzles. 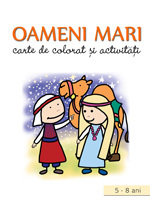 and some activities / games! 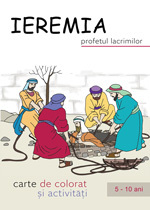 A book that presents the life story of Jeremiah, a prophet who loved his country and chose to stay with his people even in the hardest moments, giving us a true lesson of life and patriotism. Along with the simple, easily understood presentation, each page of the book contains logic games, colouring sheets, games and crossword puzzles. 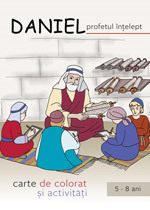 A book that tells the story of Daniel's life from his childhood when he was taken as prisoner to Babylon and into old age. 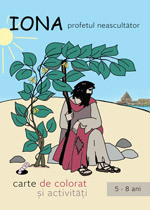 A book that presents the story of Jonah's adventures and how the prophet learned about Gods patience, mercy and love. Along with the simple presentation, easy to be understood by children, on each page of the book they will find logic games, colouring sheets, games and crossword puzzles.